Once a very learned Pundit was holding forth, in a very pedantic manner, the story of Gajendramoksha from the Bhagavatha, before the Maharaja in his Durbar Hall, and a large gathering of courtiers. He described how the Lord, on hearing the agonised call for succour from the elephant held by the jaws of the monstrous crocodile, hurried from Heaven (Vaikunta) without stopping even to collect His insignia and weapons, without even intimating to His Consort where He was going nor on what mission. Suddenly the Maharaja interrupted him with the question. 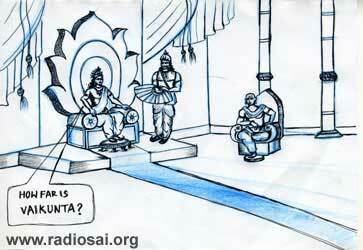 “Tell me, Pundit, how far is this Vaikunta?” The learned Pundit did not know the distance. He was nonplussed. Nor did any of the other scholars in the Palace know. But the servant who was fanning the King from behind the throne offered to furnish the answer, if his impertinence be pardoned. The Pundit was shocked at his effrontery, but the Maharaja allowed him to speak. “Your Majesty! Vaikunta is as far as the cry of the elephant could be heard,” he said. Yes, when the anguish of a devotee’s heart is expressed as a cry or a groan or a sigh, the Lord is only as far away as that sound can reach. He is always on the alert to listen to the cry of His children. 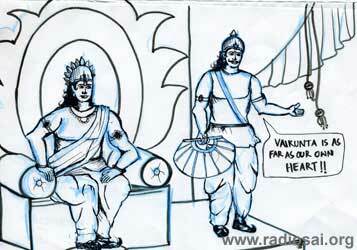 His Residence, Vaikunta, is within hearing distance of every cry, from every grief-stricken heart. That illiterate servant knew in a flash the Omnipresence and the Compassion of the Lord.